We are happy to introduce the Challenge Rooms with the latest patch! Enjoy this brand new mode in the fantastic world of Pid and unlock up to 72 brainteasing levels and compete on the online leaderboard to get the best time possible using all the tools presented in the main story line of Pid. Can you get the full three star grade in each of the levels? We dare you! When a young schoolboy gets stranded on a remote old planet, a unique and eccentric journey begins. His search for a way off the planet takes him through cities and castles, attics and space stations into a dreamlike yet dangerous world. Along the way, he outsmarts a variety of malicious robots bent on stopping him and, befriends unlikely allies that start to shed light on a huge conspiracy that keeps the planet mesmerized and prevents him from ever reaching home. The core feature in Pid allows players to manipulate a powerful force that can be used to maneuver around the levels in thousands of unique ways. To top it off, it completely changes the way you maneuver within a 2d world. It's also used to move enemies and objects, deflect bullets, activate machinery and change level layouts. Mastering the use of this core feature will turn everything you know about platforming upside down. 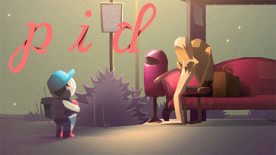 In Pid, two players can experience the adventure together. In coop-mode, players are expected to truly cooperate in order to safely advance through the levels. Both are highly dependent on the other, and even if friendly cooperation is a must, there is plenty of room to wildly compete and test your retro skills against your friends. During the course of the game, players will experience a lovely and very special soundtrack composed and recorded by Retro Family - a small group of studio musicians that focuses on tailored music for games, films, dance and theater.